August 20, 2011 / New York -- The High Line is a relatively new park in New York City. 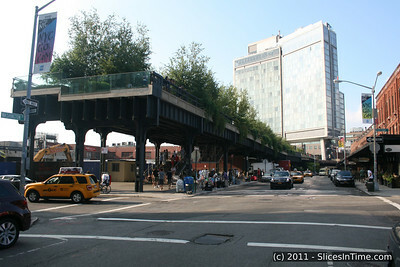 It's a former elevated rail line on the west side running from Gansevoort Street in the Meatpacking District to West 34th Street, between 10th & 11th Avenues. It was destined to be demolished until some visionaries in 1999 lobbied to convert the space into an elevated walking park. This effort was backed by Mayor Bloomberg and the first section which runs from Gansevoort Street to 20th Street opened in June, 2009. The middle section was just opened in June of 2011 with the completion of the final northernmost section to still be determined. After having a late lunch at a diner near the Gansevoort Street entrance, we began the walk. They've done such a nice job building this park. The first impression is the quality of the infrastructure. It is very modern with rugged materials, yet very aesthetic. The use of stainless steel and concrete and an effort to only subtely conceal the rails which are allowed to show in places. The rails seem to speak of their former life. Walking along the meandering path, you are exposed to a view of the city that is much different than what you see at street level. The plantings soften the view and there are generous seating areas with benches that gently lift out of the pathways. There are stairways at most street crossings, some with elevators, making it handicapped friendly. At 15th Street, where the path passes through a building are vendors selling things such as shaved ice and art. As we approached the northern end, there was a musician playing his electric guitar on his fire escape which echoed through the area. The path narrowed slightly and passed very close to the buildings there, some of which were very old while others were brand new uber-modern residential buildings. Finally we arrived at the current end of the line at 29th Street, took the stairs to street level and walked to the subway at 8th Ave and 34th Street.